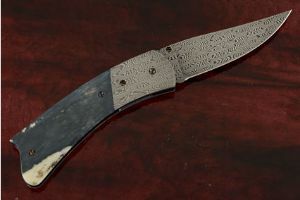 Description: Billy Bob Sowell of Iron Horse Forge, earned his Master Smith stamp in 2009 and currently lives in Georgia. He worked as a locomotive engineer for Norfolk Southern Railroad for 39 years and before that was a Poseidon missile tech on a nuclear submarine. Since childhood, knives were a fascination of his. Billy Bob learned from some of the best in the industry. 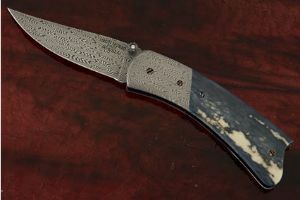 Mastersmith Rick Dunkerley taught him to make damascus and folders. Rick's influence is clearly visible in this elegant gent's folder. Mastersmith Jim Batson taught him to make Bowies. Mastersmith Don Fogg taught him just about everything else … from heat treating to finishing. He even took Fogg’s sword class at Campbell Folk School and went to about every hammer-in that he could over the years, learning from countless presenters who helped him along the way. 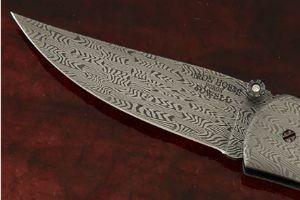 Billy Bob won the award for “Best Antique Bowie by an ABS Journeyman Smith” three years in a row – making him the only maker to have won three times. 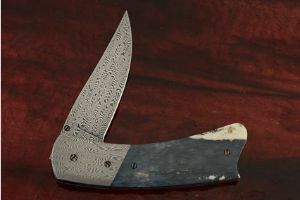 This folder features a blade forged from Billy Bob's own mosaic damascus. The basketweave pattern damascus shows tremendous control at the forge. He introduces virtually no distortion in the complex pattern. 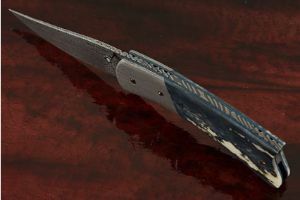 The blade has silky-smooth action and is perfectly centered. It is easily opened single handed. Ancient walrus ivory scales are dovetailed to mosaic damascus bolsters for a perfect fit. 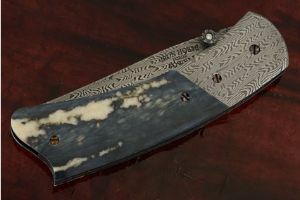 The presentation grade walrus ivory scales feature rare blue tones. The colors enter the ivory across thousands of years as minerals move into the ivory from surrounding soil. 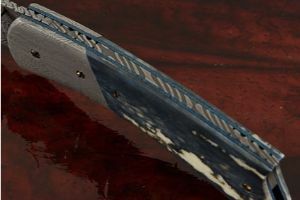 5N20 carbon steel liners are heat blued and textured. 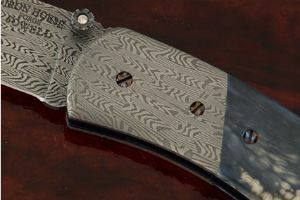 The liners surround a bold twist pattern damascus backbar. Screws throughout are heat blued and hand fileworked.